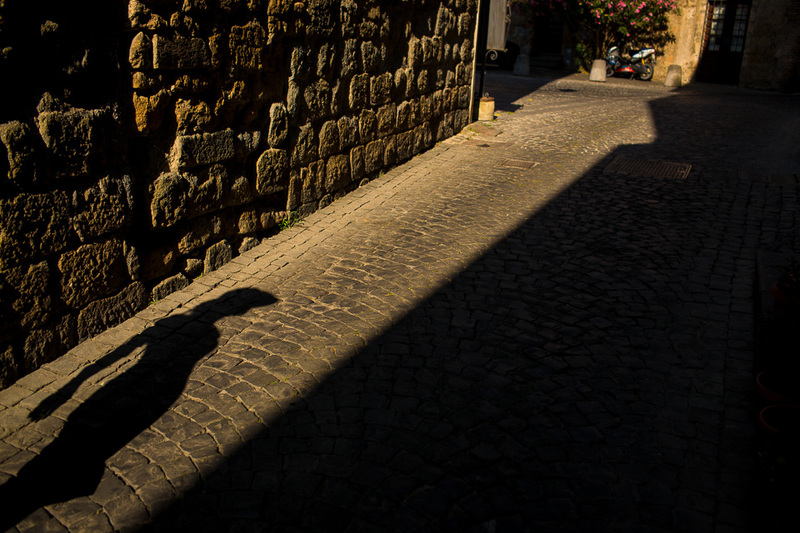 Today’s photo roundup is brought to you by the amazing hill towns of Central Italy. 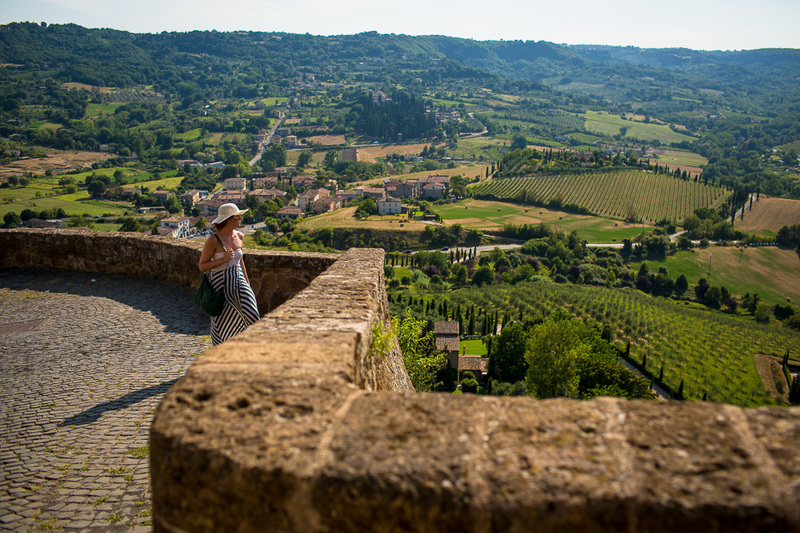 This region is remarkable for its rich history, agricultural output (and resulting food and wine), natural beauty, and wealth of things to see and do. We only had a couple of days, but managed to take in a lot. 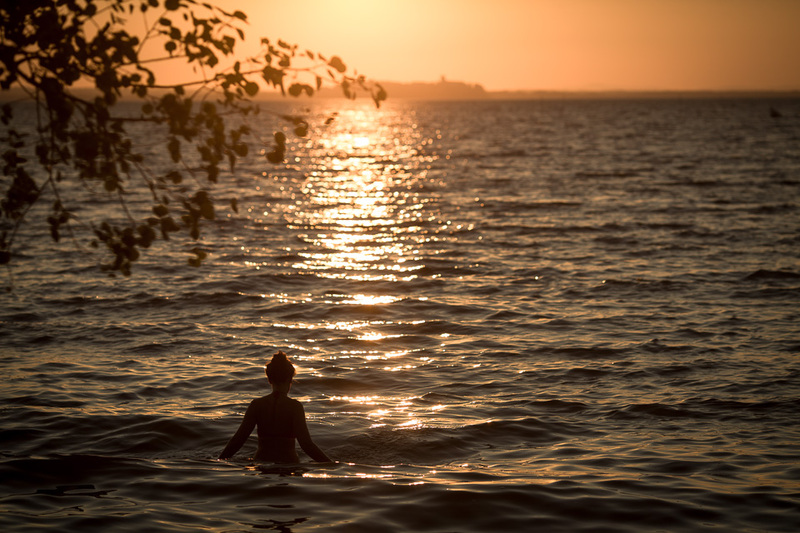 Due to the scorching summer heat (temperatures have remained in the 35-40 degrees celsius range), we found ourselves traveling from lake to lake in our rented Westfalia van. 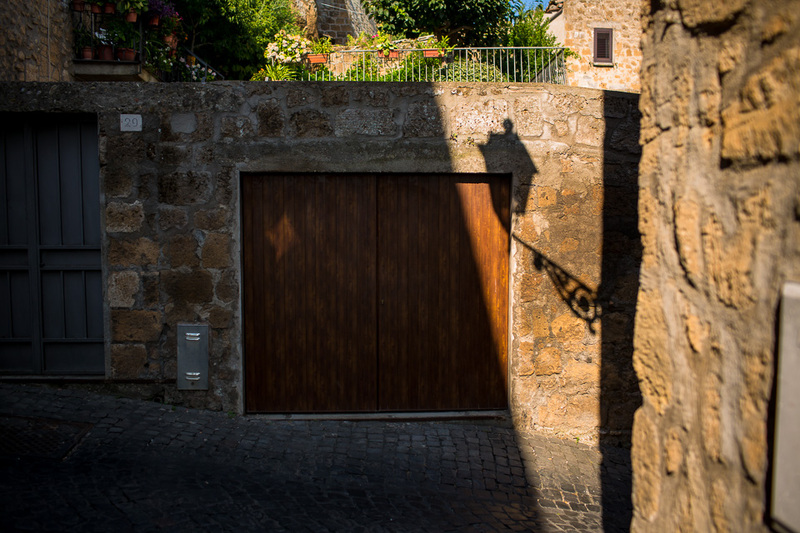 You really do need a vehicle to get around this part of the country, and even with one, it takes a long time to drive the windy roads and often steep hills between towns. 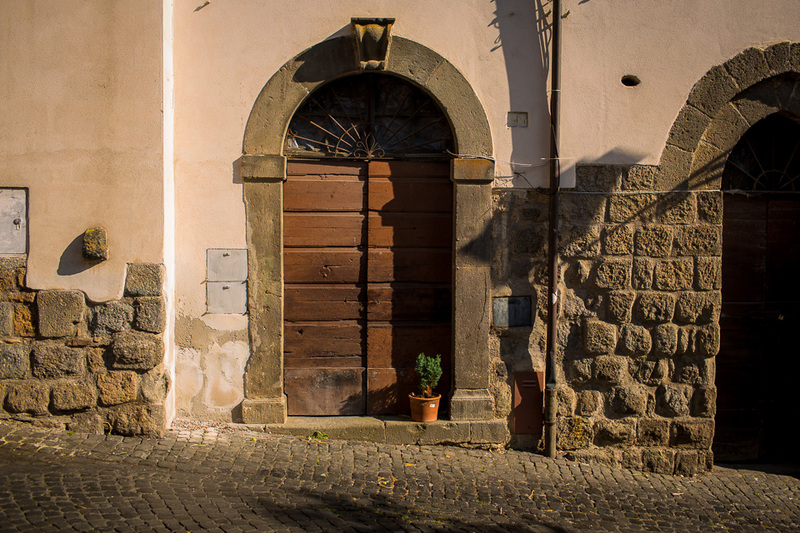 Built in strategically defensible positions, there are hundreds of hill towns in this part of Italy, each offering unique views, sites and local specialties. 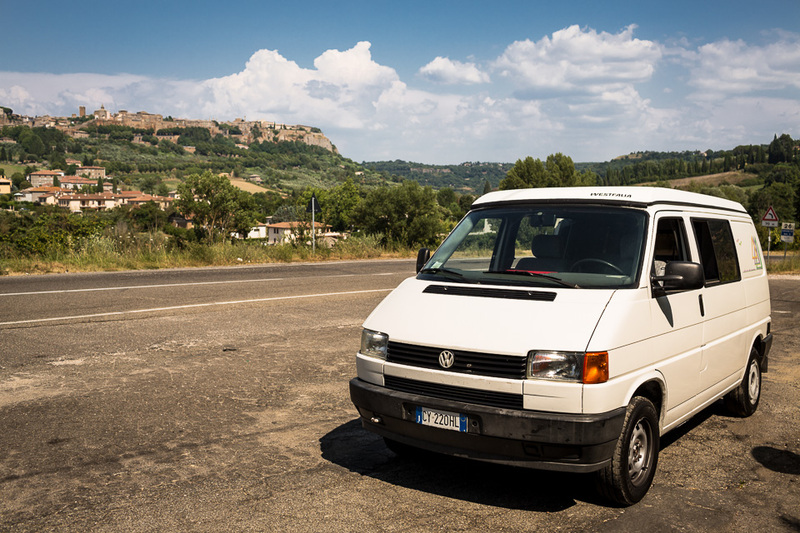 Bella Brunhildalina, our Italian rented VW Westfalia. She’s been a good girl, despite her grindy-sounding third gear, bad smell (it’s the drain – ewwww), and not always wanting to start the first time. 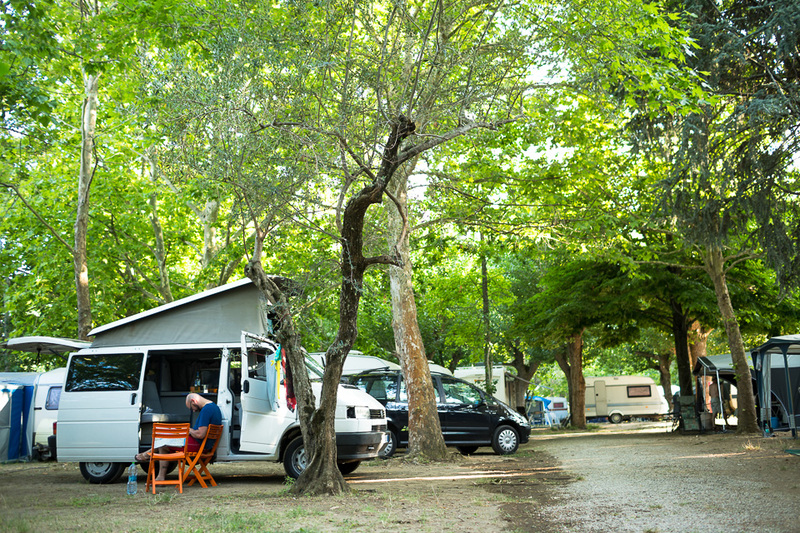 Our campsite on Lake Bolsena. I am not passed out due to heat exhaustion, but rather hunched over to scrutinize our road map. 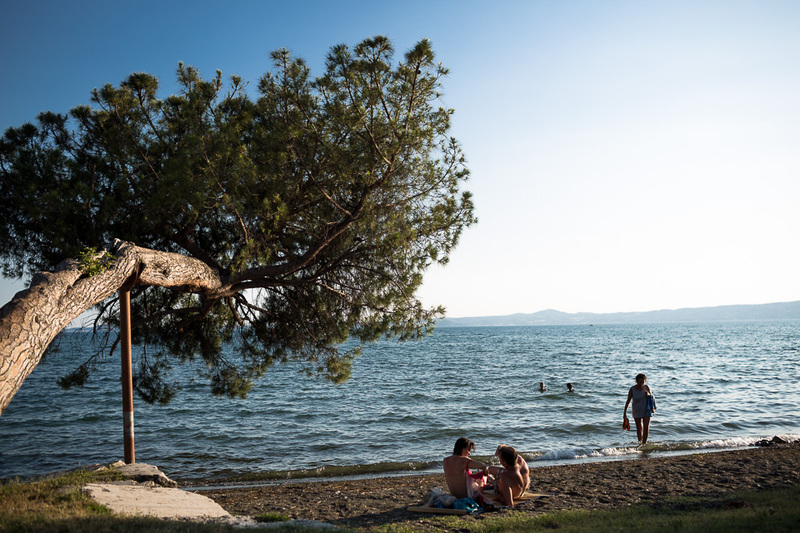 Laura took some nice pictures of Italian families enjoying the shores of Lake Bolsena. 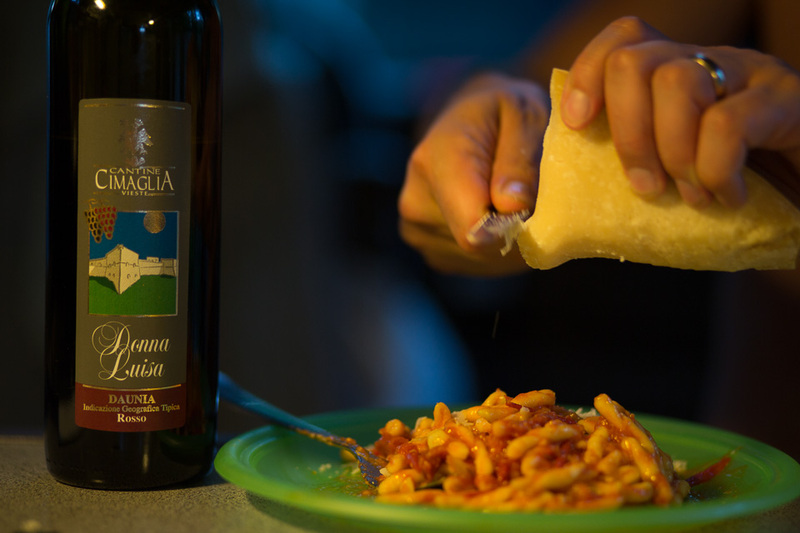 Laura making us some pasta dinner in Bella Brunhildalina. 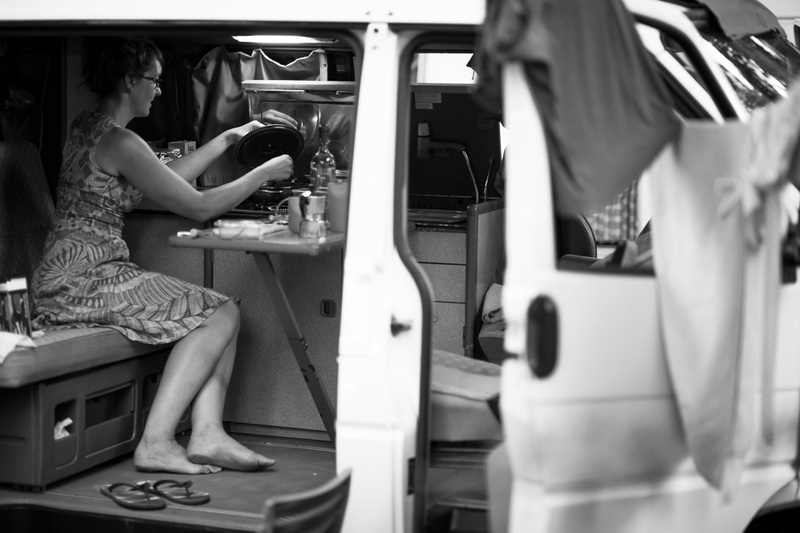 Notice her dirty feet (a feature of van life) and the clothesline in the foreground. Clothes dry pretty fast when it’s hot enough to melt your face off. 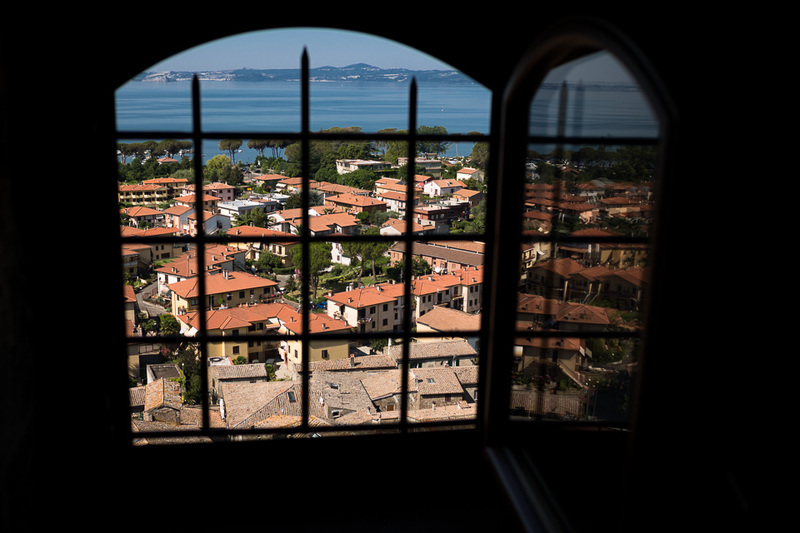 After a night in a Bolsena campground, we visited the Bolsena castle, which includes a museum of local Etruscan and Roman artefacts, as well as a cool aquarium exhibit in the basement teaching kids about the lake ecosystems. 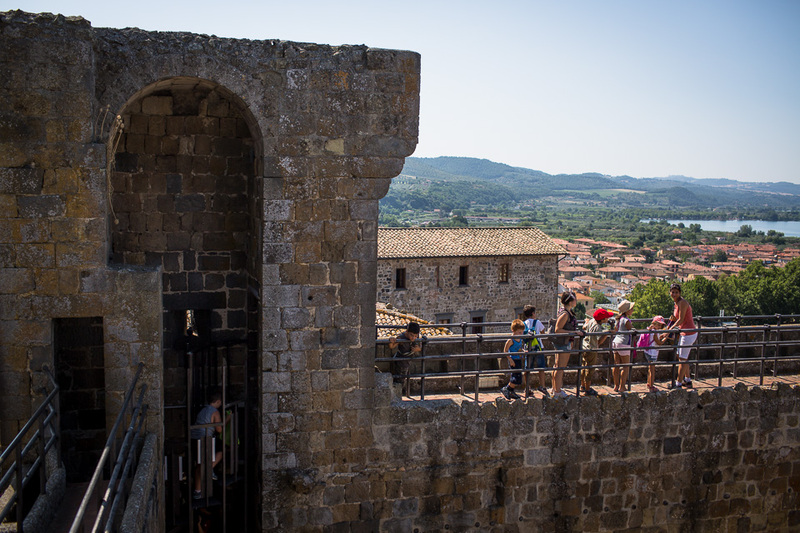 An Italian school group was visiting the castle the same time as us. 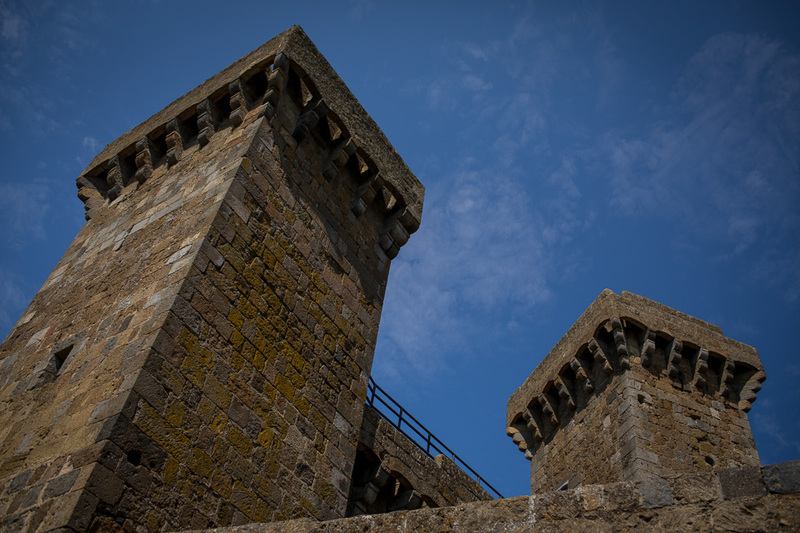 They seemed to dig the battlements and aquarium the best. 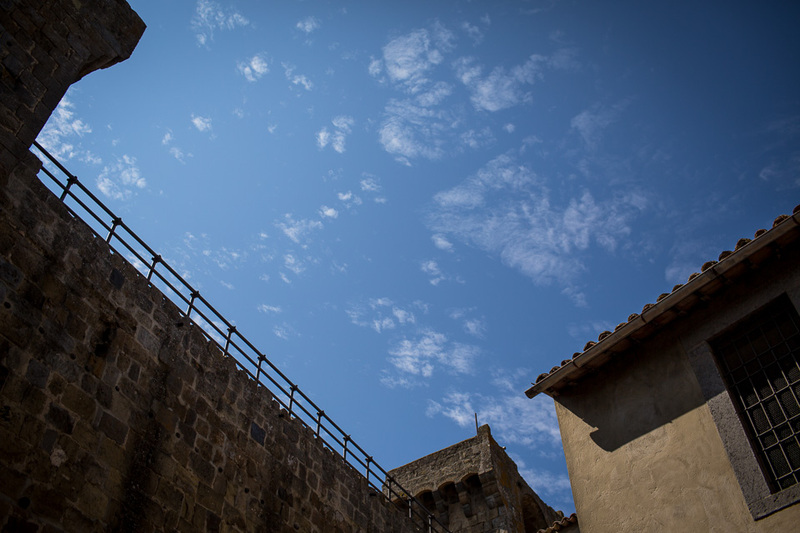 Bolsena Castle. According to something we read, the castle on this site dates from the 4th century BC, but the present structure is almost certainly medieval. 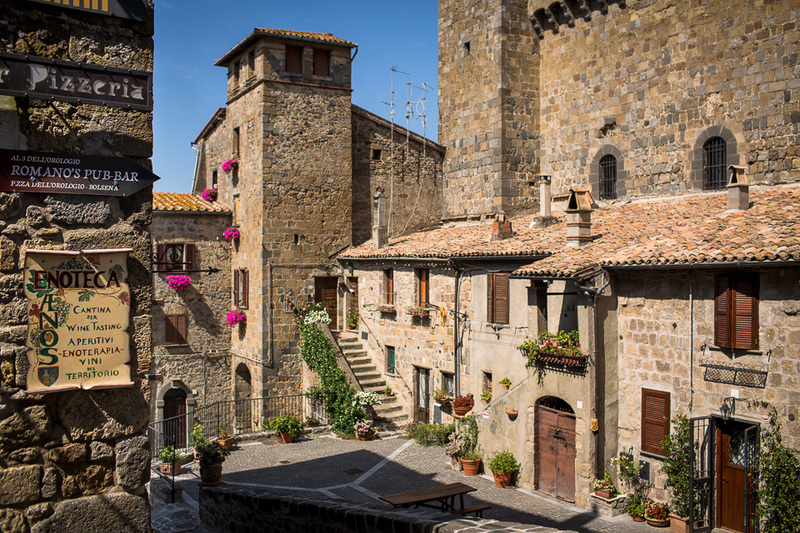 Bolsena still has its medieval district intact. 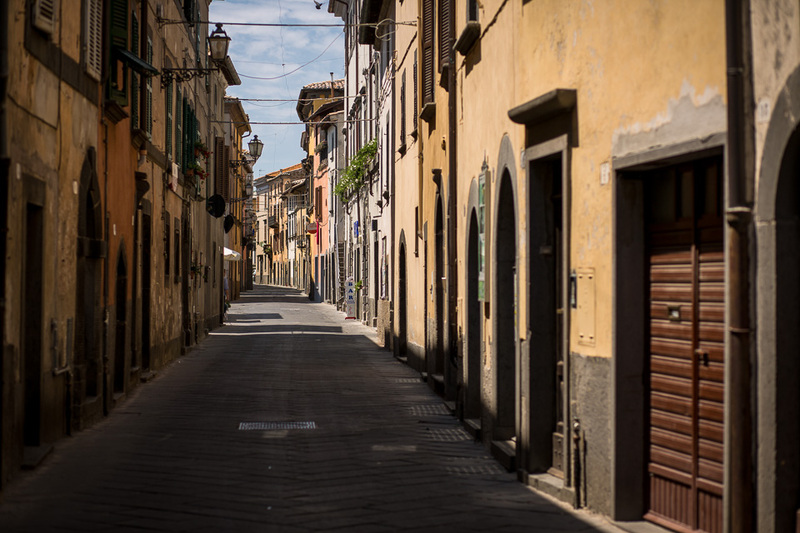 It was blissfully cool within the high, narrow streets. 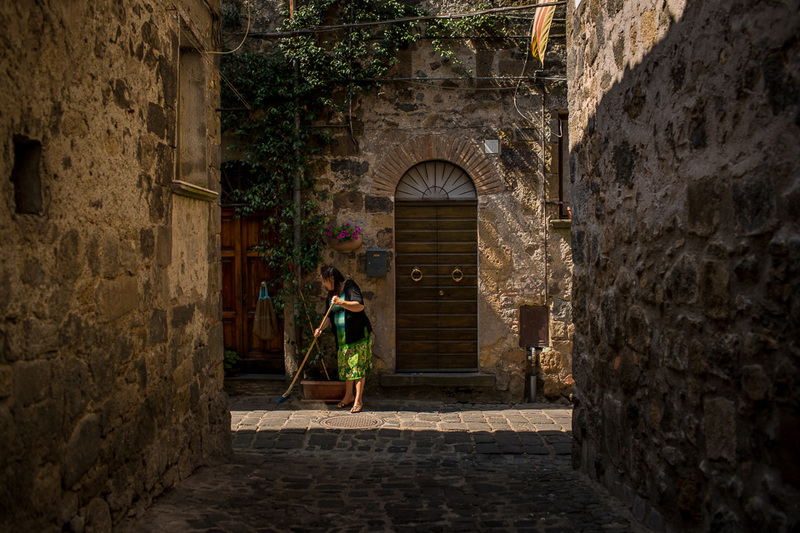 A woman sweeping up in Bolsena. 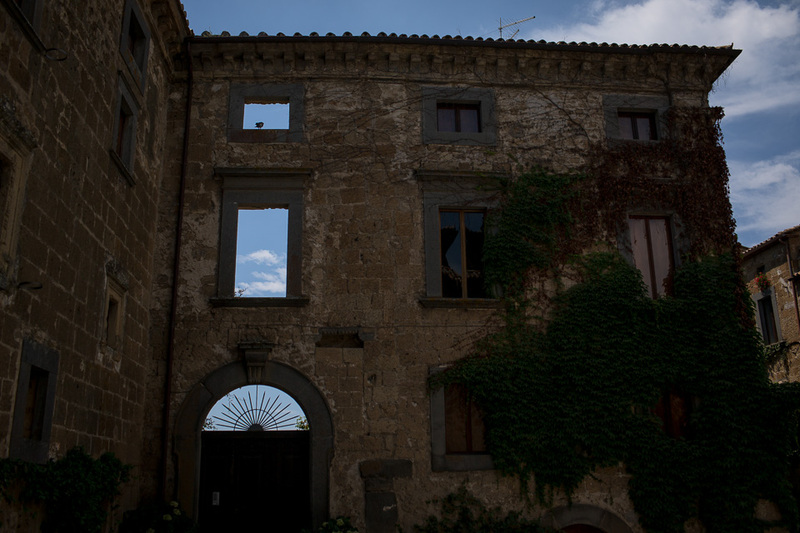 We visited Civita di Bagnoreggio, a famous nearby hilltown. 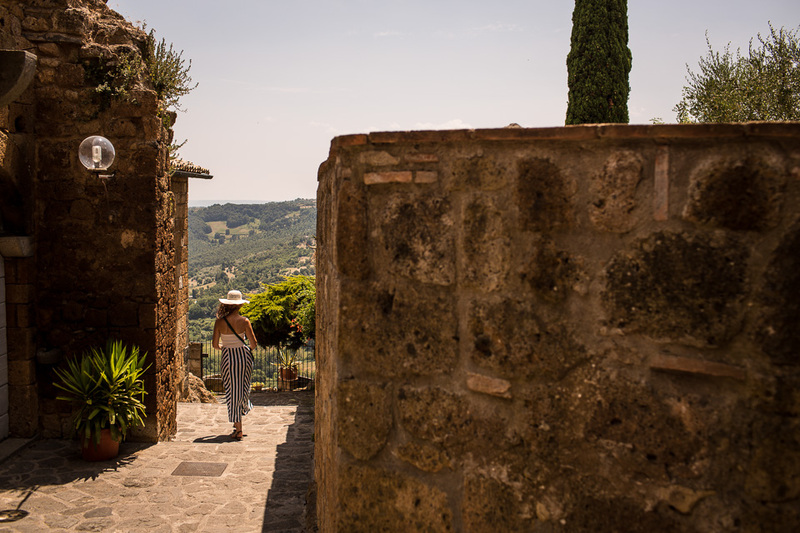 According to Rick Steves, in the guidebook that Laura’s parents lent us before our trip, this town has only recently succumbed to full-on tourism after the last of its lifelong residents died, taking with them a lifestyle and local economy that existed for centuries. 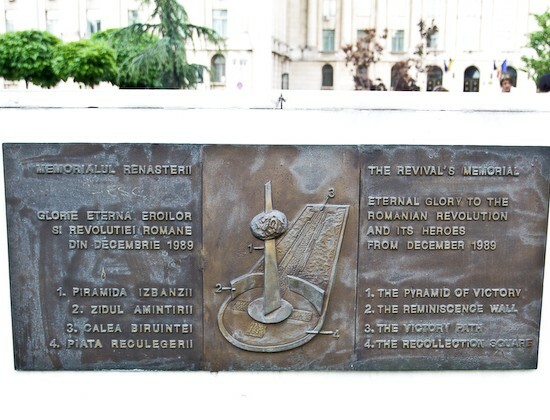 It’s still worth a visit. 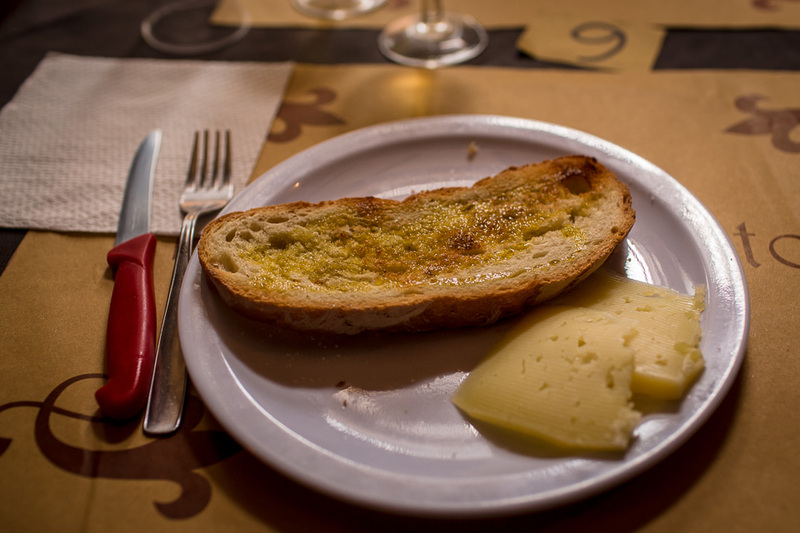 This was the tastiest garlic bruschetta I’ve ever eaten. So much garlic. Such good olive oil. So simple. So delicious. 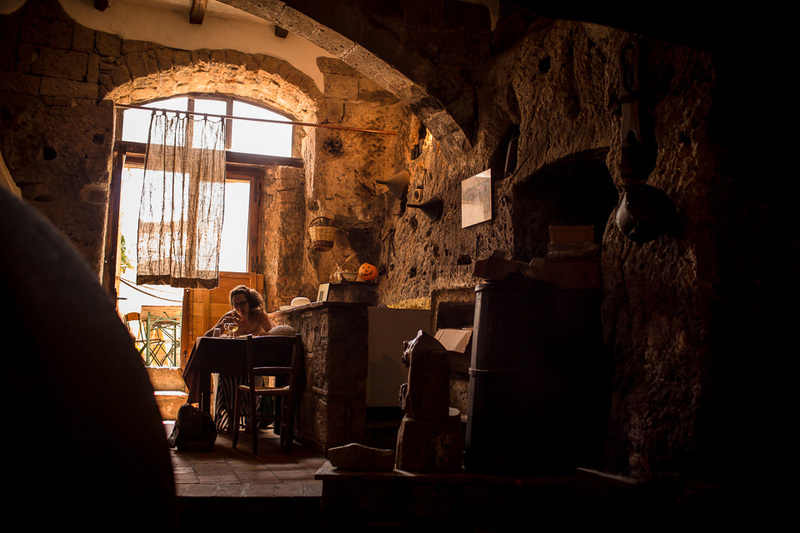 We stopped for lunch in Civita di Bagnoregio at a family-run restaurant in an underground grotto. Laura exploring the streets and enjoying the views. 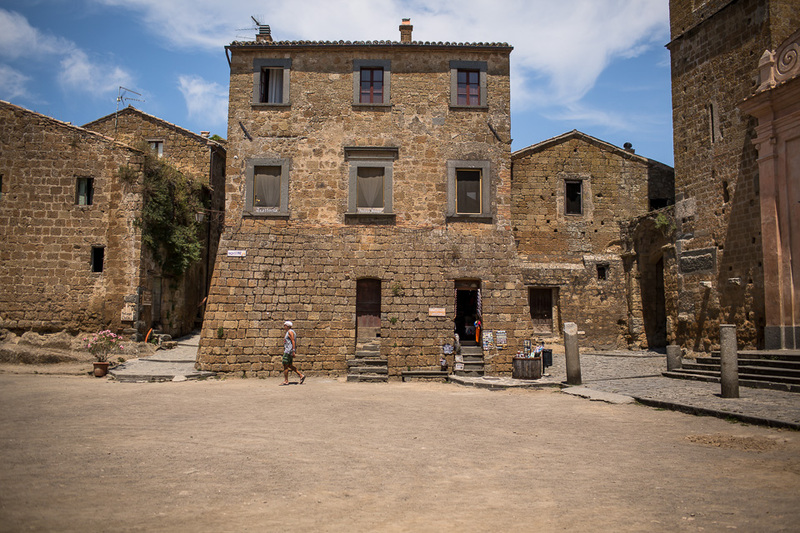 The main square of Civita di Bagnoregio. Notice the foundations, reinforced after the big earthquake sent portions of the town falling into the valley below. 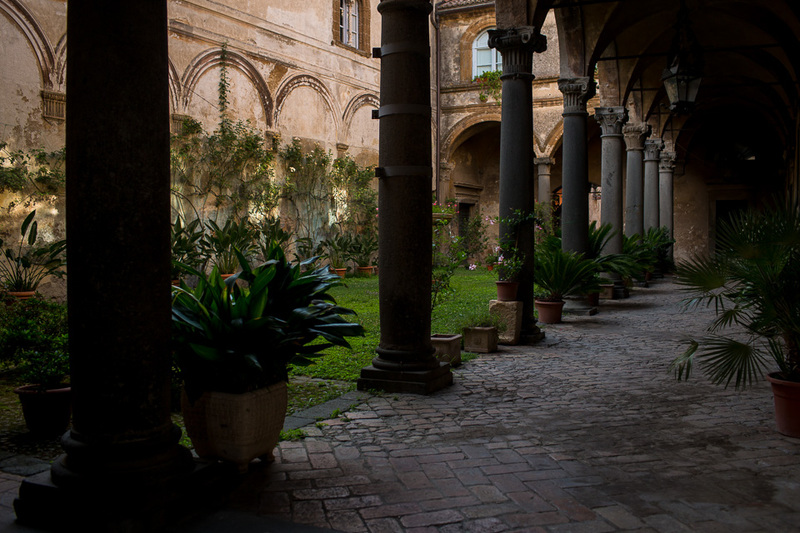 The columns at right are Etruscan. 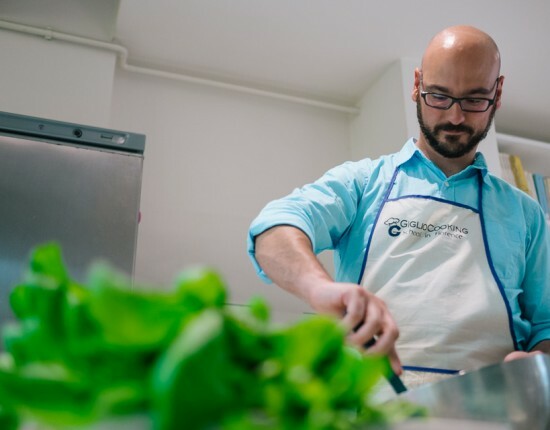 A handful of interesting restaurants offer tasty local fare. At some point in the 17th century,half of this palace collapsed down the slope during an earthquake. 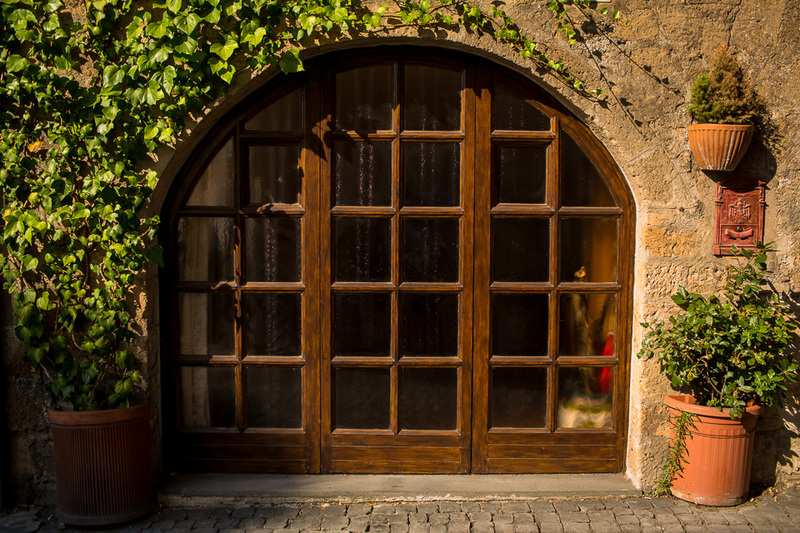 Now these windows and this door open to the cliff drop instead of a fancy foyer. The main entrance to town. 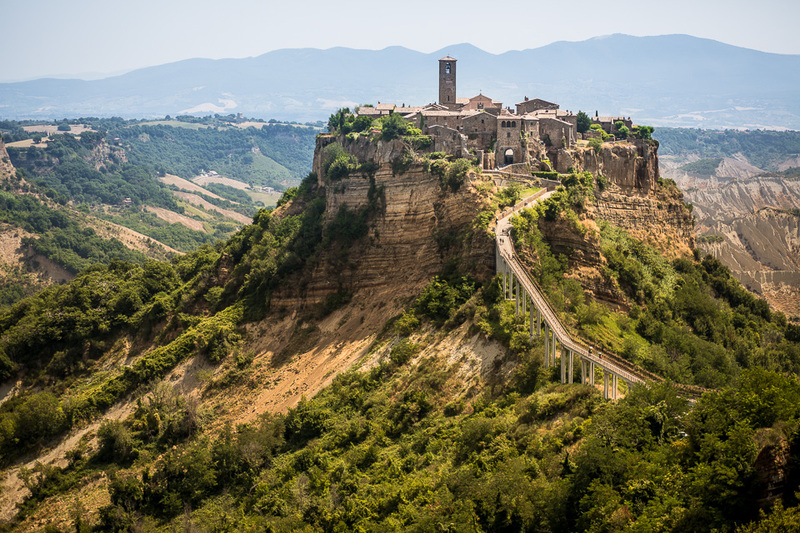 The old medieval town is connected to the more renaissance era town of Bagnoregio by a long foot-bridge. Business owners ferry goods into Civita via scooters and little vehicles. Everyone else walks. 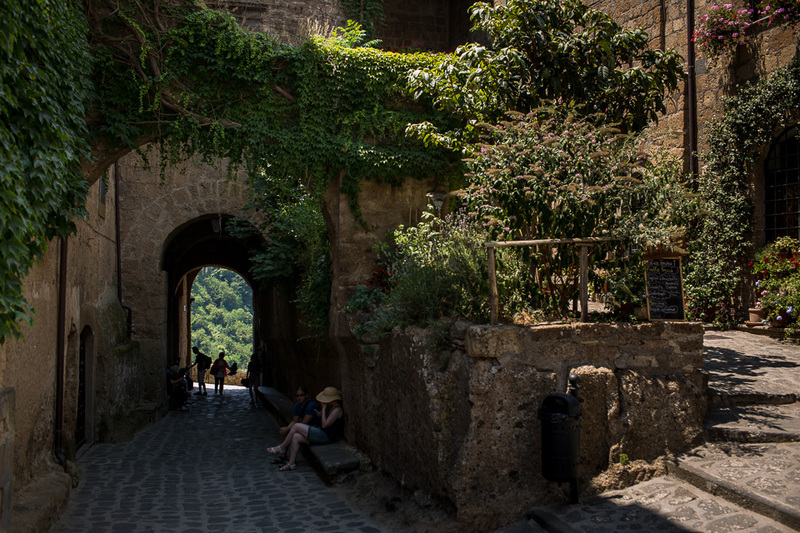 We parked in Bagnoregio, and walked about 20 or 30 minutes to get from our parking spot to the Civita citadel. On the way out we took a wrong turn and ended up driving down a long and steep gravel road which slowly narrowed until we realized it was definitely not taking us to a major road (but more likely a farmers field). Laura helped spot me, as I backed the van about 500m uphill along the steep and bumpy trail before being able to turn round. A little sketchy, but we made it. 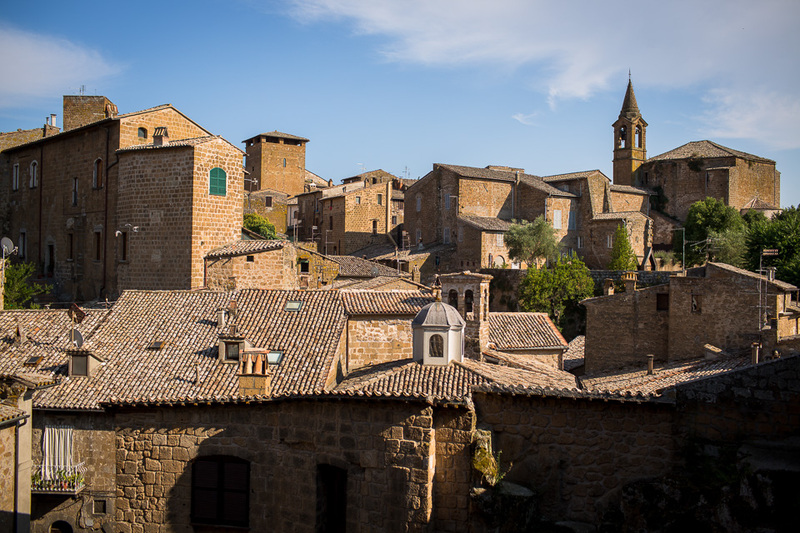 From Civita di Bagnoregio, we drove 30 minutes or so through beautiful countryside to the base of Orvieto, one of the bigger hill towns in Tuscany. From our parking spot at the base of the cliff, we took a series of underground escalators into the old town. On the other side of town, you can take a funicular. It’s also possible to drive in, but parking can be tough up top. 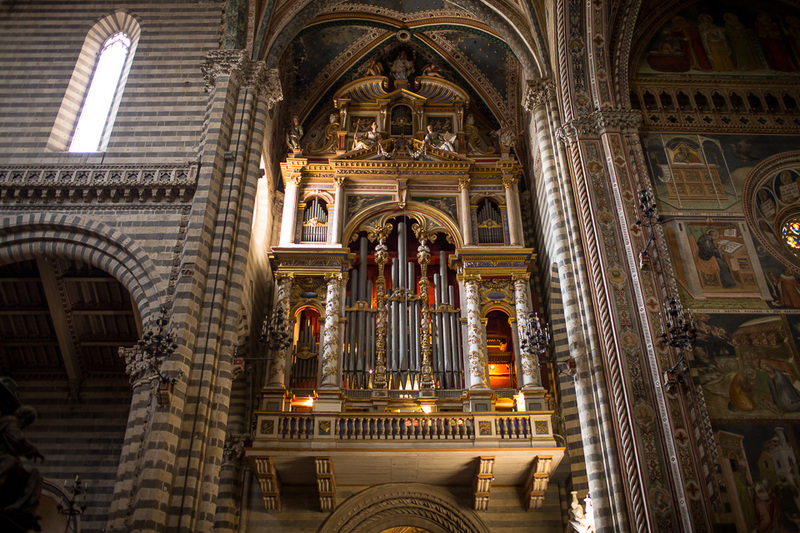 Orvieto is famous for its cathedral, among other things. 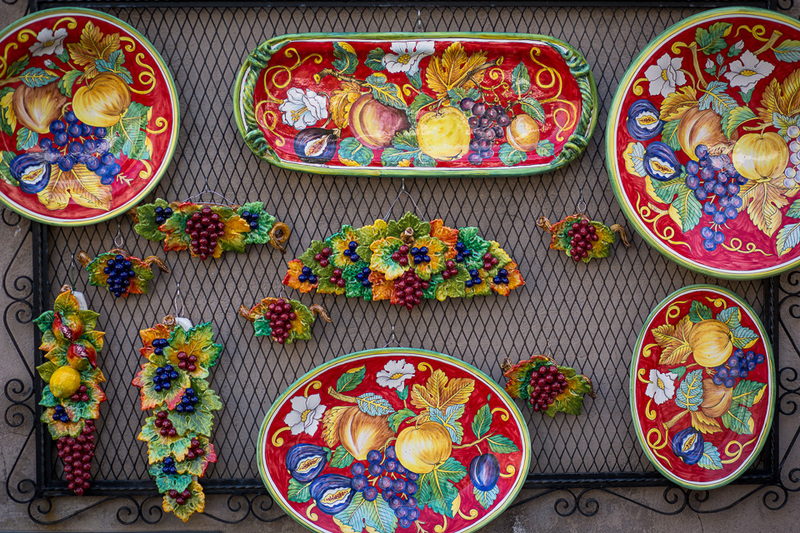 According to our buddy Rick Steves, Orvieto is also famous for its ceramics, several types of which were available at local shops. 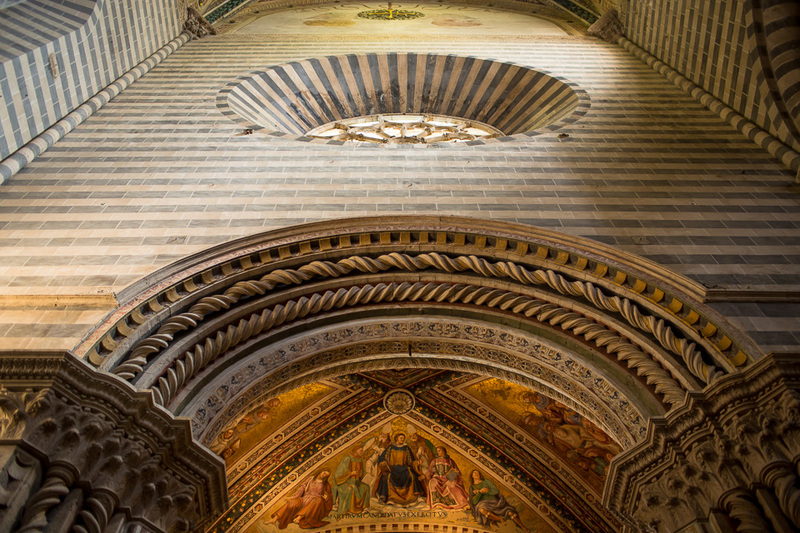 Orvieto cathedral. 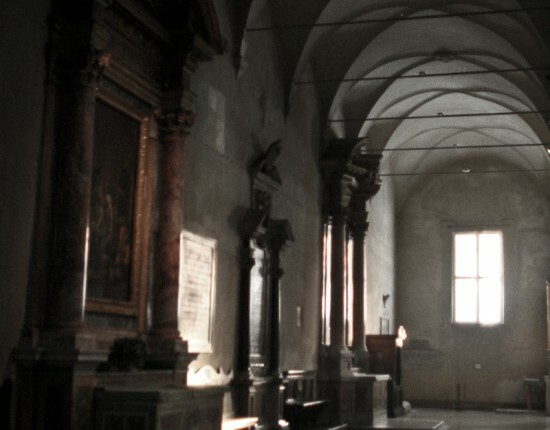 The facade was under construction, but the inside is a treasure trove of art. 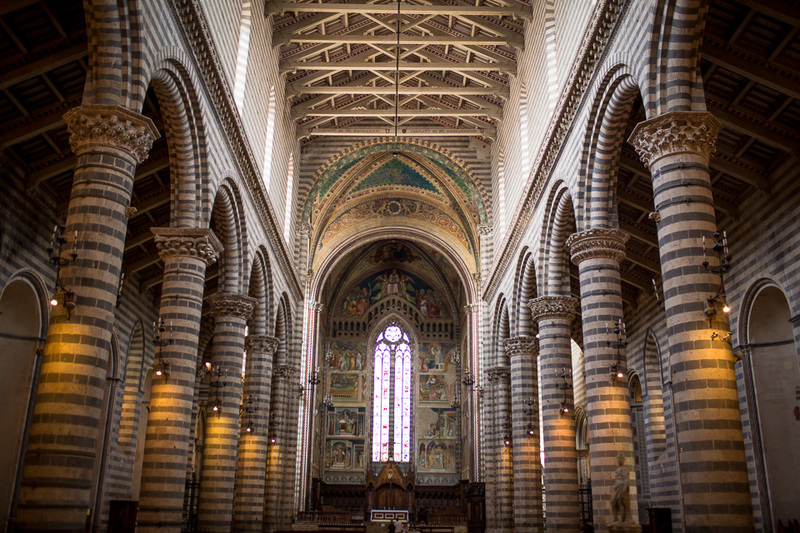 It was an interesting mix of cool marble and warm light from lamps and alabaster windows. 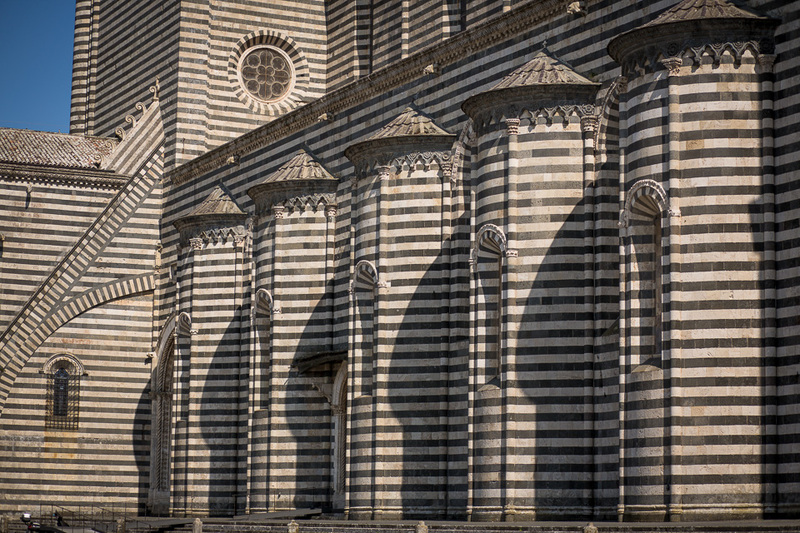 The Orvieto cathedral has several intact alabaster windows. This thinly cut stone was used before stained glass became more common. It leant a warm light to the interior (accented with additional warm bulbs) that contrasted in an interesting way with the very cool white and grey marble. 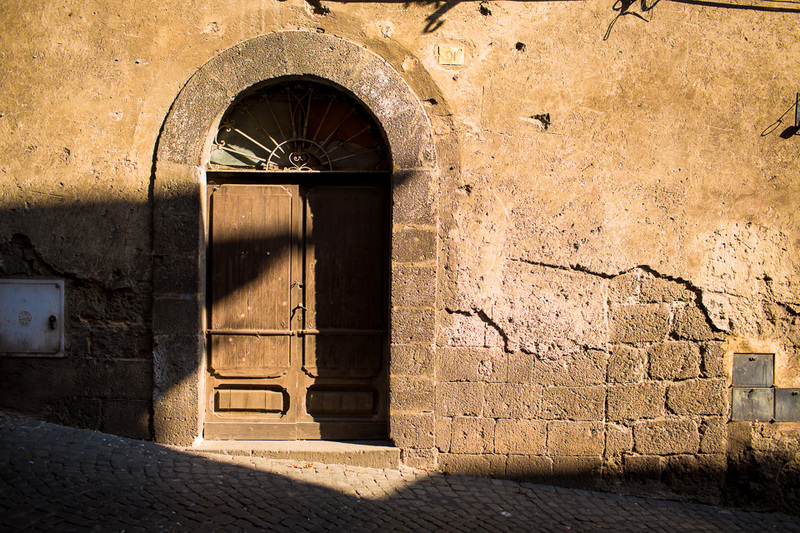 The sun dropped in the sky and we enjoyed a golden hour walk through Orvieto. 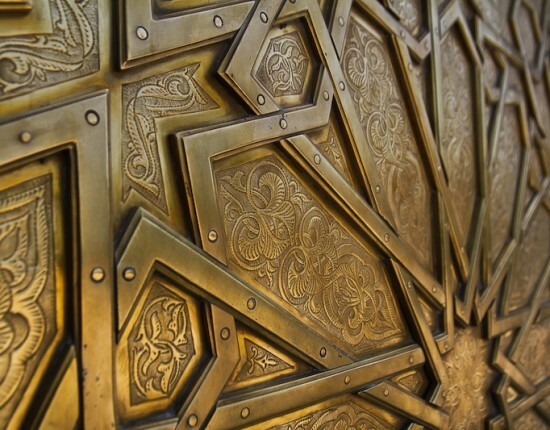 I took the opportunity to photograph some of the local doors. 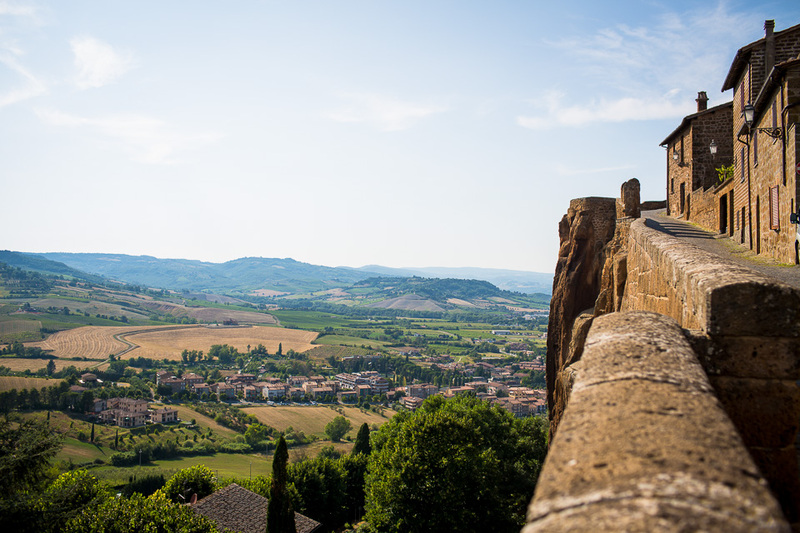 The view southwest from the walls of Orvieto. 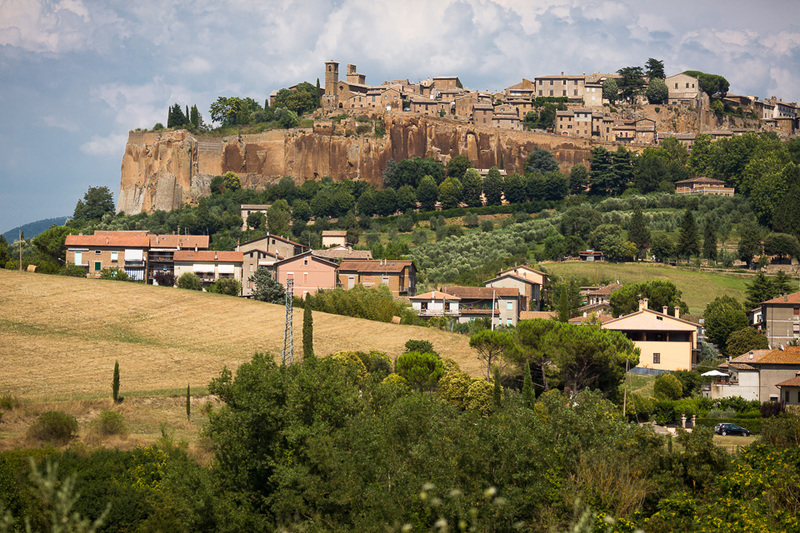 Orvieto was an Etruscan site before it was a Roman town, Medieval city, Renaissance City state, or modern tourism Mecca. 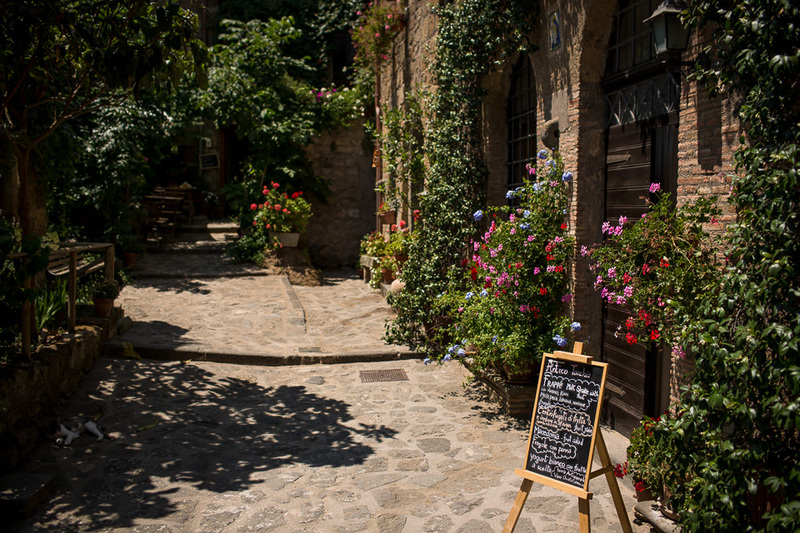 Even after visiting here many times, Italy never ceases to amaze us with its little side streets and hidden courtyards. 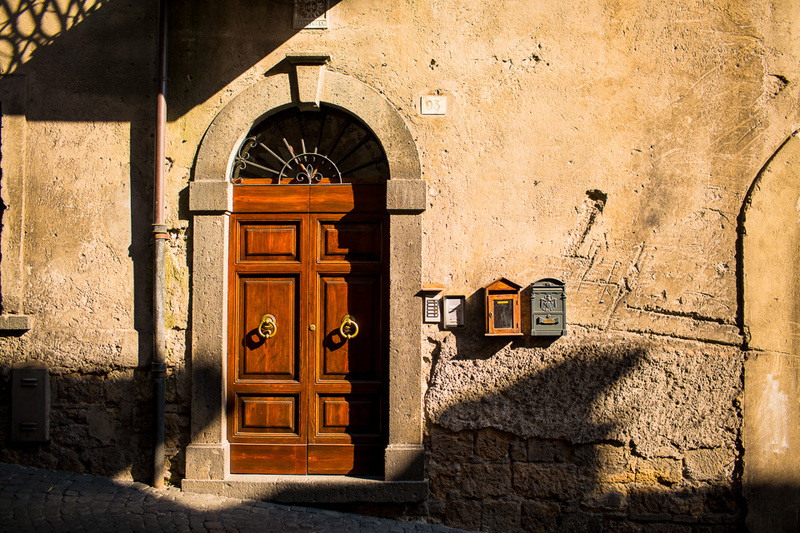 We peaked in on this little slice of paradise hiding inside a half-opened doorway off a non-descript street. Ridiculous. 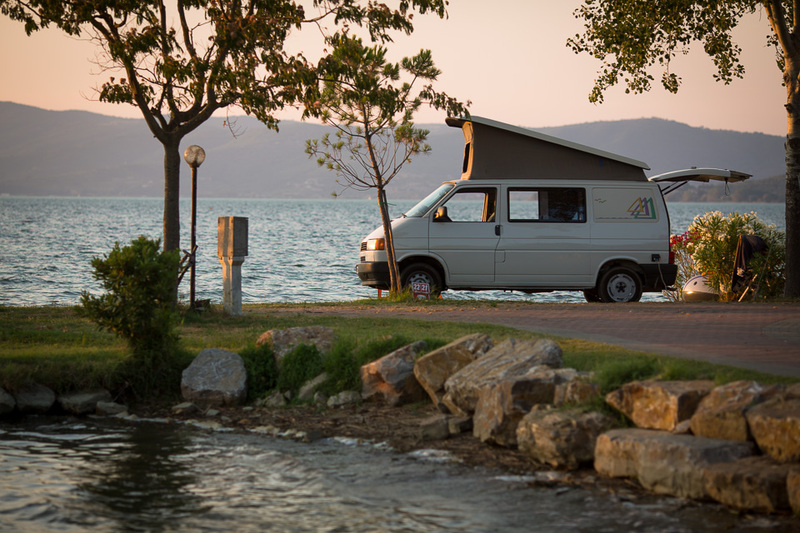 After a super full day of walking, we hit the road for Lago di Trasimeno, about an hour from Orvieto, where we snagged a lakeside camping spot and took a late-day dip in the lake. 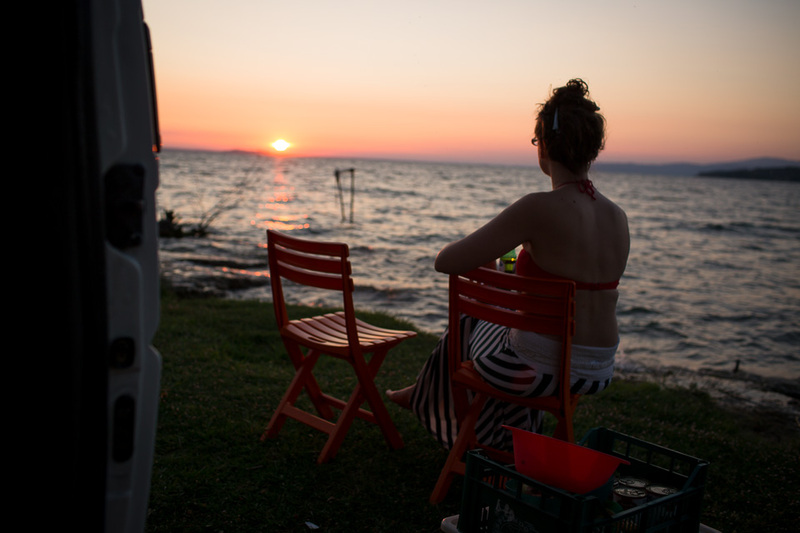 Laura enjoying a Lake Trasimeno sunset. Bella Brunhildalina, enjoying some much-deserved rest after a long day climbing the hills of Toscana, Umbria, and Lazio. 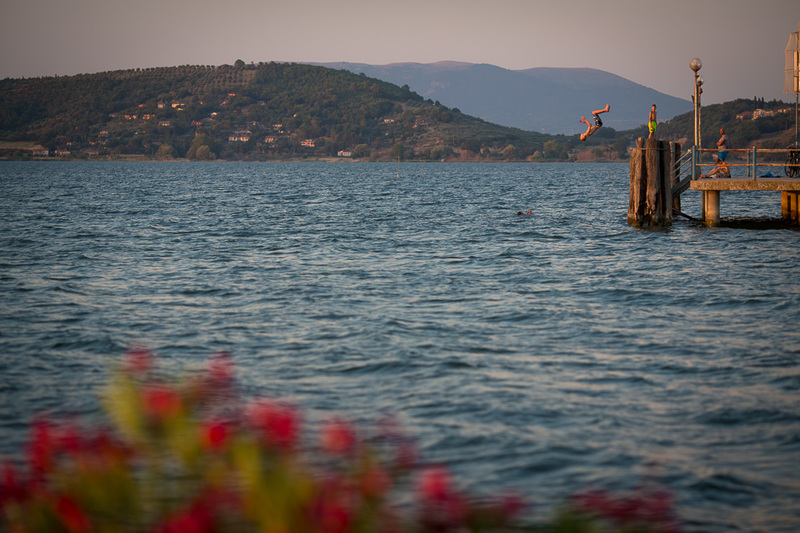 Italian boys cooling off in Lake Trasimeno. Although the lakeside camping was beautiful, later that night our van was swarmed by thousands of little aphids, mosquitoes and other skin-crawling bugs. We hung out in the dark to avoid attracting more (learned that lesson the hard way), and spent the last 30 minutes before bed squishing literally thousands of the little bastards who had made it into the van. The photo Laura took of the pile of bug-splatted tissue is too disgusting for polite company, so we’ll end on this pretty shot instead. 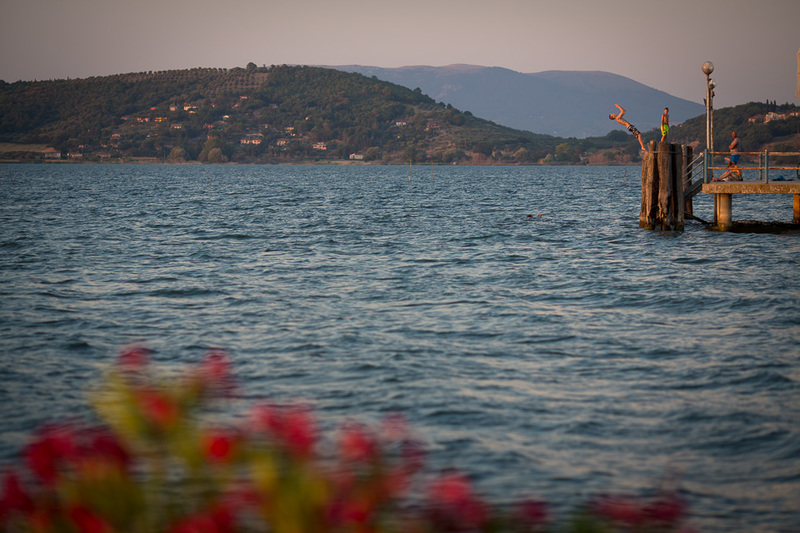 If you ever camp on the shores of Lake Trasimeno, do yourself a favour and pick a spot further away from the water. 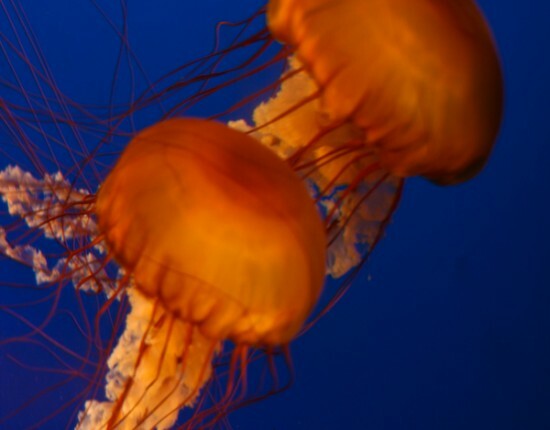 Incidentally, this is our 200th post on the site since starting it in 2010. Thanks to everyone reading this and everyone who has visited the site in the past. 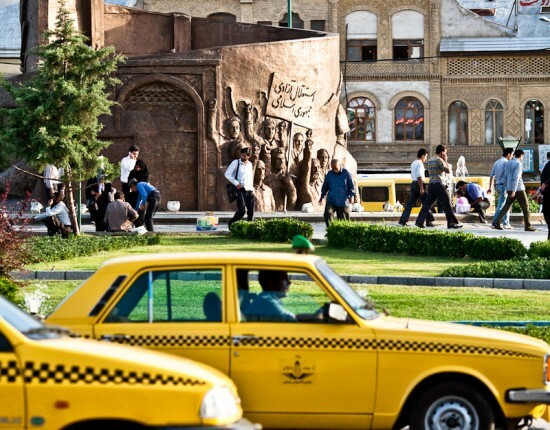 We have been lucky indeed to see so many places and get a chance to share some of it with you here. Leave us a comment below (it makes our day!). Looks like you are having a wonderful time! Love the van! 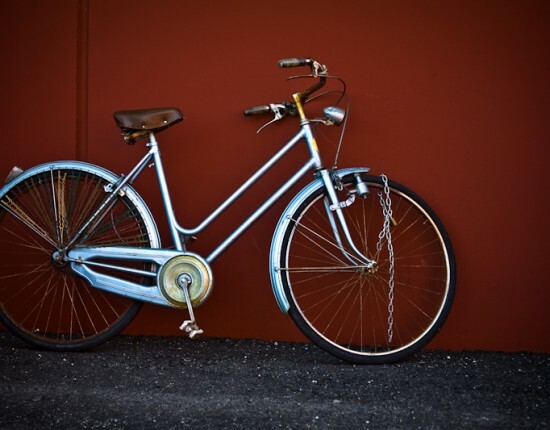 What a neat way to travel! Thanks Rachel. Congrats on the vow renewal!